The more damage you have taken with your current character, the better are your chances to initiate a Team Assistance Attack. 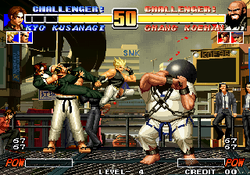 The character that participates in the Team Assistance is always the next character in line, so the first character is assisted by the second and the second character is assisted by the third. Often is indicated by 2, normal by 1 and never by 0. This page was last edited on 25 December 2016, at 09:58.